E. O. Wilson's remarks upon learning of Hurricane Creek Park's creation E.O. Wilson is University Research Professor, Emeritus, Harvard University University of Alabama, B.S. (1949), M.S. (1950) Pulitzer Prize (1979, 1991), National Medal of Science (1976). Hurricane Creek Park came about through the passion, dedication, and commitment of diverse group of individuals, organizations, and agencies. Its existence is a tribute to cooperation among elected officials, appointed officials, and those whom they represent. The Park was created through a joint effort between the The Friends of Hurricane Creek, The Trust for Public Land, Tuscaloosa County PARA, Tuscaloosa County Commission, and the family of Stanley Parks, who wished to establish an outdoor, automotive-free natural preserve for our community. In 2010, acting PARA Director Don Kelly sold the park land to ALDOT for the Eastern Bypass. Mr. Kelly has since retired. Gary Minor, a thoughtful and generous public servant, is the current Director of PARA. In 2007, readers who responded to the Tuscaloosa News' “Seven Wonders of Alabama” survey ranked Hurricane Creek behind only the Native American Indian mounds at Moundville. 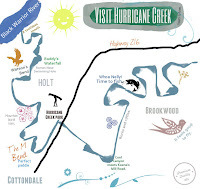 According to the Alabama Department of Conservation and Natural Resources's website, Hurricane Creek Park is designated as a wonderful stream for fishing. So bring your bait and tackle. Hurricane Creek Park is open to the public from dawn to dusk. It is a wonderful place to explore native plants and aquatic wildlife, canoe down the creek, or spend time enjoying nature with friends and family. Visitors are encouraged to wear rubber-soled shoes so that they will not slip on the shale which exists along part of the stream. This shale is very sharp and can cut bare feet. Families can also enjoy hiking the Eagle Scout Trail, which begins at the park entrance is marked by a blue blaze on trees. 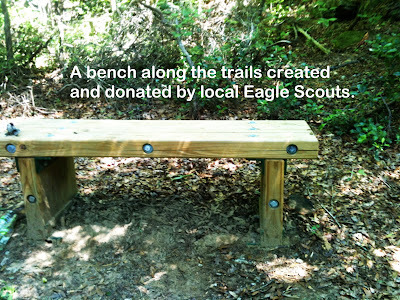 There are two hand-made benches along the length of this trail where you can stop to enjoy the scenery. Since there are a number of small creek crossings and rocky climbing areas, this trail is best suited for kids over the age of 5. Since a park is a public space, what you do there affects others. Please follow park rules when visiting. Those who do not follow park rules may be arrested or removed from the park. Motorized vehicles are not allowed beyond the park gate. Glass containers are not allowed- use juice boxes, plastic bottles, or aluminum flasks to carry drinks instead. No loud music or profanity is allowed in the park. Alcoholic beverages are not allowed under in any form in the park. Do not deface or tamper with any natural objects or park structures. Please deposit all trash in the multiple trash cans available at the park. Report any rule breaking to PARA at 562-3210 or to a local park ranger. A Park Without A Parking Area? Since local taxes help support our parks, it makes sense for local taxpayers to be able to visit the parks without incurring undue risk of injury. Currently, Hurricane Creek Park does not have a safe, usable parking area for visitors. PARA has been working hard to get a safe parking area added to the park for a few years now. Since the Park is designated for community use and not simply as a mud-riding trail, we think a park without a parking area doesn't make sense. 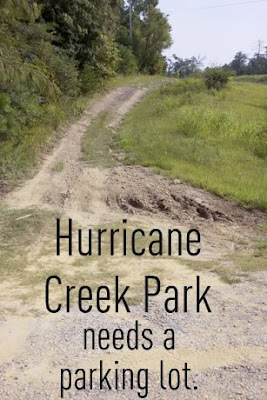 If you would like to in convincing ALDOT to allow a safe, community-friendly parking area at Hurricane Creek Park, send an email to lifeathurricanecreek@gmail.com and indicate your interest. 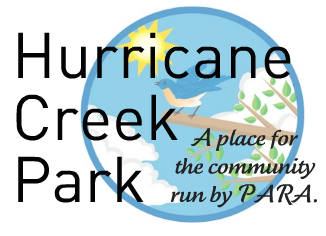 Be part of the solution by donating to our Hurricane Creek Park fundraiser for PARA. All donations are tax-deductible. On July 23, 2008, the Tuscaloosa County Commission unanimously approved the acquisition of a special piece of land known as the M-Bend. 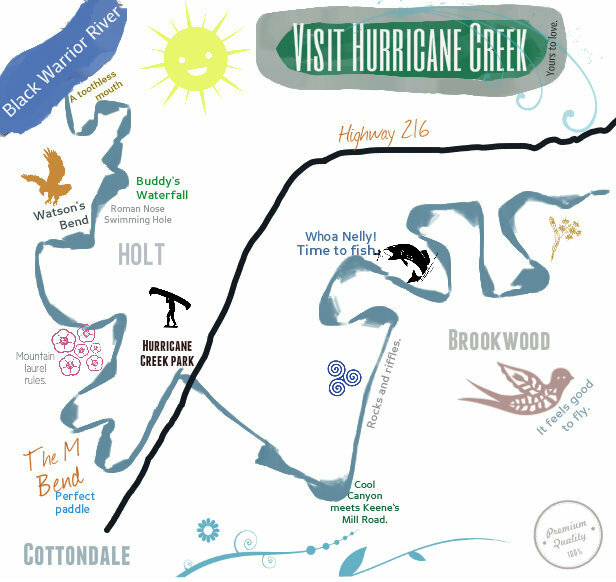 This 250-acre property lines Hurricane Creek, a major tributary of the Black Warrior River. John Wathen, Hurricane Creekkeeper for The Friends of Hurricane Creek, made a deal with the land owner. If Wathen could find a willing buyer, the property could be protected. Charles Scribner, Director of Development for Black Warrior Riverkeeper, put John in touch with Michelle Melton at the Trust For Public Land (TPL), a national land conservation organization where Scribner interned in college. Providing excellent maps, pictures, and biological information about this vital area, Wathen convinced TPL to visit the M-Bend. TPL agreed to purchase the property if Wathen could find a receiver for the deed. Wathen suggested the Tuscaloosa County Park & Recreation Authority (PARA). PARA and TPL met, and agreed to move forward with protecting this beautiful and biodiverse property. The Tuscaloosa County Commission's vote sealed the deal. The undeveloped piece of land will now remain undeveloped forever, and provide citizens with public access to a great outdoor destination along Hurricane Creek. Thank you John Wathen (Hurricane Creekkeeper), The Friends of Hurricane Creek, The Trust for Public Land, Tuscaloosa County PARA, Tuscaloosa County Commission, and, most of all, to the family of Stanley Parks for making this historic transaction possible. Creating a natural park in our county has been a long and complex journey. You can learn more about this journey and how community members have contributed from the following links. How local Eagle Scouts left their mark on Hurricane Creek Park. The Tuscaloosa News editorial urging for preservation of Hurricane Creek Park. John Wathen's thoughts on Hurricane Creek Park on September 13, 2010.